Judge Tobin will be remembered as a loving family man and loyal friend. He was proud to serve as an attorney, Superior Court Judge and Navy Captain. He attended Princeton University on an NROTC scholarship and majored in English. Judge Tobin was assigned as a surface warfare officer on the San Diego-based destroyer USS John A. Boyle. He continued in the active Naval Reserve for 30 years achieving the rank of Captain. 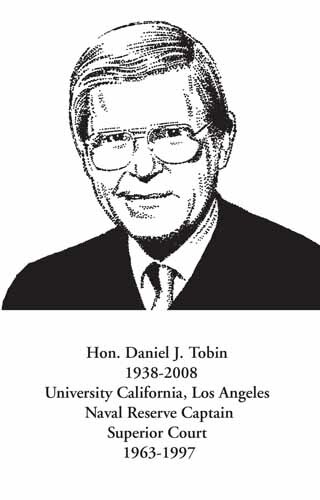 Judge Tobin attended UCLA School of Law. He became a partner with the law firm of Harelson, Enright, Knutson & Tobin. In 1981, Judge Tobin was elected president of the San Diego County Bar Association, emphasizing attorney ethics and professionalism. He was also elected to the California State Bar Board of Govenors and was founder and first chair of the California State Bar Competence Consortium. He is a past president of the Foothills Bar Association. In 1989, Judge Tobin was appointed to the Superior Court by then-Gov. George Deukmeijian where he earned a reputation for being calm and thoughtful and was skilled at making difficult, contentious situations civil. His assignments included Probate Judge and Presiding Judge of the Family Law Division. He left the bench in 1997 after suffering a stroke. Judge Tobin was president of the La Mesa Kiwanis Club in 1976 and received awards from the Boy Scouts of America: the Silver Beaver Award in 1988 and the National Distinguished Eagle Award in 1992. Those who knew Judge Tobin will greatly miss his gentle spirit, keen wit, and thoughtful wisdom. His wife Eleanor, daughter Debbie Mark Carpenter, sons Frank and Tom Tobin, their spouses and nine grandchildren thank his friends in the legal profession for honoring Dan.